This set of 4 large, hardcover unit books facilitate whole-class science instruction in the primary grades. Grade-specific Big Books allow teachers to model scientific process or literacy skills for the whole class. 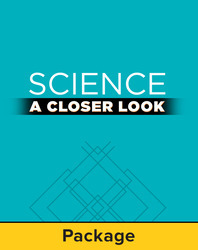 Books are divided into Life Science, Earth Science, Physical Science, and Be a Scientist units. Each book is individually bound and equipped with a carry handle for ease of use in the classroom.